Surety can handle all the details. With well over 100 years of combined experience, our closing agents have thorough knowledge of all aspects of the closing process. Customers of Surety Land Title derive many benefits from doing business with us. Our experience and expertise allow for a smooth, comfortable, and professional real estate closing. 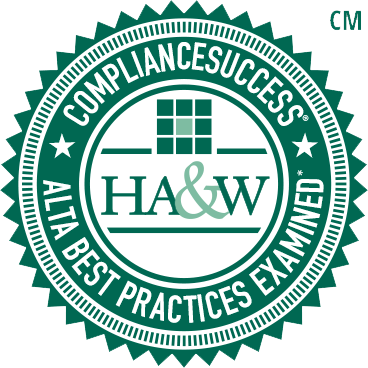 Surety Land Title is HA&W Compliance Certified. Click for more information. Through our broad customer base, we have established strong relationships with real estate related businesses throughout the Gulf Coast, further making your closing easier. Allow Surety Land Title to handle your next transaction, and you will see the difference our team of professionals can provide. Call our team of professionals Serving the States of Alabama and Florida. Surety Land Title, Inc. is committed to keeping your non-public personal and financial information protected and secure. We recognize your need for appropriate protection and management of any non-public information you share with us. Where Surety Land Title, Inc. collects Personal Information, we intend to post a purpose statement that explains why Personal Information will be collected and whether we plan to share such Personal Information outside of Surety Land Title, Inc. or those working on Surety Land Title, Inc.’s behalf. We do not intend to transfer Personal Information without your consent to third parties who are not bound to act on Surety Land Title Inc.’s behalf unless such transfer is legally required. Wherever your Personal Information may be held within Surety Land Title, Inc. or on its behalf, we intend to take reasonable and appropriate steps to protect the Personal Information that you share with us from unauthorized access or disclosure. To the extent that you do provide us with Personal Information, Surety Land Title, Inc. wishes to maintain accurate Personal Information. Where we collect Personal Information from you, our goal is to provide a means of contacting Surety Land Title, Inc. should you need to update or correct that Information. If you need to send updates and corrections about your Personal Information please send the corrections to: charlotte@suretyland.com and we will make reasonable efforts to incorporate the changes in your Personal Information that we hold as soon as practicable. Third parties provide certain services on Surety Land Title Inc.’s behalf. Surety Land Title, Inc. may provide information, including Personal Information that Surety Land Title, Inc. collects to third party service providers, to help us deliver programs, products, information and services. Surety Land Title, Inc. will take reasonable steps to ensure that these third party service providers are obligated to protect Personal Information on Surety Land Title, Inc.’s behalf. Surety Land Title, Inc. does not intend to transfer Personal Information without your consent to third parties who are not bound to act on Surety Land Title, Inc.’s behalf unless such transfer is legally required. Similarly, it is against Surety Land Title policy to sell Personal Information.